"System Failure" introduces my favorite of all of the princess supporting characters showcased in the First Season of She-Ra and the Princesses of Power. 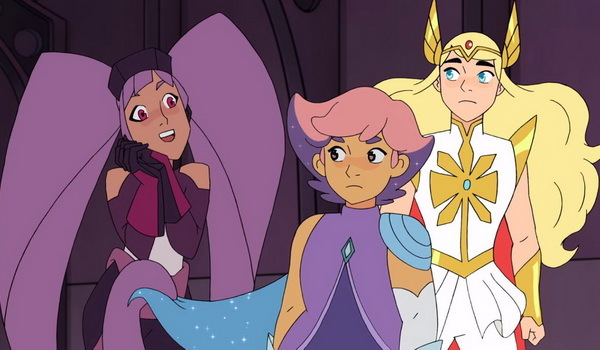 Unlike the other princesses, Princess Entrapta (Christine Woods) exhibits no special powers (unless you count her wild hair acting as an extra pair of hands when needed). Instead, the manic Entrapta offers a character thoroughly invested in technology, experimentation, and robots, which gets her in trouble here when some incompatibility between her robots and First Ones' technology leads to all the robots in her maze-like kingdom going berserk. When the virus infects She-Ra (Aimee Carrero) as well, it falls on her friends to save the day. Entrapta's experiments here, and later in the series, show us that the line between magic and technology is blurry on Etheria which relies on both for its very survival.